This is my entry to the PTC11. It's teeny tiny, on a 50x50 map and with literally zero triggers. I lost the entry I was working on for quite a while, so this isn't a serious contender for the title. However, it offers something that I don't think I've seen done before, so hopefully you'll find it worth the download! -Julius999 for his Designer's Editor which proves invaluable for fitting trees in between buildings! I find that the whole of the thing looked pretty, in and of itself. Only when put in context of how someone would go about building an island city does it start to lose it's luster. If you planned it out a bit more (say, had a little more coastline, as people build on coastline, not hard to reach islands) As I said, it looks great until you think "is this who i would plan it out?" It's not a category in the judging, so i really only docked you a quarter point for it. the other quarter point was for the sand strips (which look ugly by themselves) in the fish farms. I'm not posting this as a review As I don't go as in depth as I would for a review, and I'm leaving that for the judges. NowhereT's Entry to the Pretty Town Contest is only a 50X50 map, but therefore well designed. The mainland is a good looking jungle, and the author did a good job with map copying the mountains. I liked the bay, formed with cliffs that went into a nice beach. The rest of the map, is made of good mixed water with a lot of fish, and some very small islands. These mini islands were very busy, filled with a mix of Asian and Mexican buildings. In addition, there were good looking bamboo's between them. 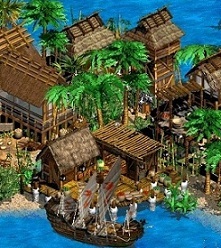 I liked the naval habor, but i think, it looked a bit squary. Additional Comments: A real good entry, it would have scored a bit higher if the map was a bit bigger. a 50X50 map is easy to fill, especially, if half of it is water. Good job in overall, i would recommend the download!